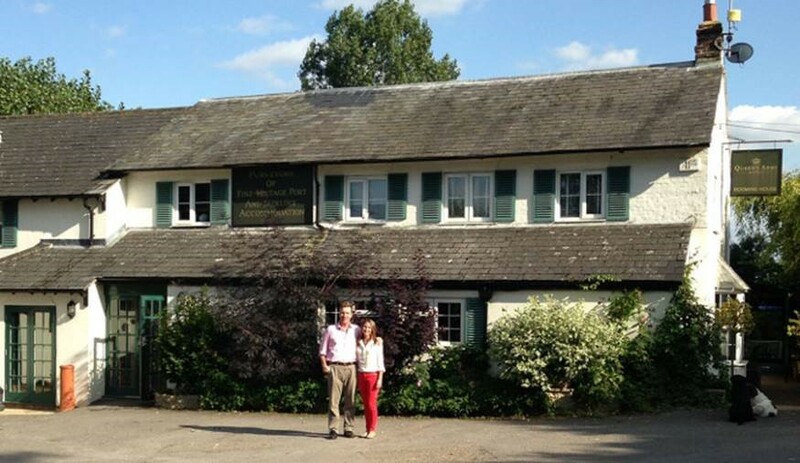 The Queen's Arms, East Garston, Berkshire, sleeps 2-24 in 12 bedrooms. The Queens Arms is an award winning pub, restaurant and hotel set in the beautiful village of East Garston, conveniently placed between London and the West Country - easily accessible by road, rail and air. 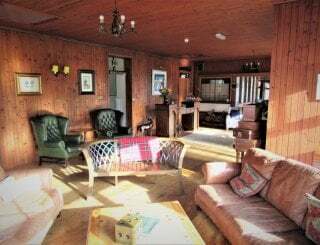 The Queen's has its own exclusive venue, The Queen's Lodge, featuring a large oak beamed room with an open fireplace, large south facing terrace and private garden. The venue is ideal for all bespoke events, including parties, weddings and anniversary celebrations as well as executive board meetings, conferences or office team events. Situated in the heart of the Lambourn Valley, an area of outstanding natural beauty and home of the racehorse, the Queen's Arms is well positioned for exploring the many local market towns, going to the races or visiting many well known tourist attractions. On arrival at The Queen's Arms you will discover a large friendly bar, with comfortable seating and a log fire, serving local ales, a wide selection of spirits and an extensive wine list. This leads into our dining room, capable of seating intimate tables of 2 to a large party of 40 and then out through French doors to the covered terrace, a south facing patio and a large enclosed garden – all ideal for alfresco dining. Children and dogs are welcome. We offer an extensive menu that is varied and seasonal and, where possible, uses local produce. Every Friday is Fish Friday with the freshest catch being delivered from Looe Bay in Cornwall that morning. The Queen's has 12 individually styled and beautifully decorated en suite bedrooms, all with seriously comfortable beds, crisp linen, soft towels and complementary REN toiletries. Flat screen TVs and superfast broadband are available in all rooms. 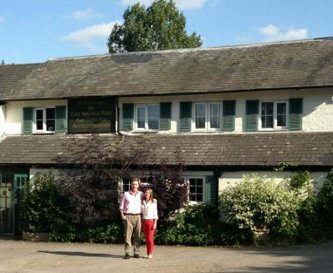 The Queen's Arms is privately owned by Freddie and Sue Tulloch, who also own the adjoining farm and stables from which guests can partake in clay days, horse riding, picnics. The couple also run a hospitality company so organising extra curricula events is no problem - horse racing, tickets to Wimbledon and football packages can be arranged. The Queen's Arms has won the Best Hotel Award for the past three years and features in Sawdays. The Queen's Arms is open all day and breakfast, lunch, tea and dinner can be served at any time with menus created to suit private parties. The Queen's can fit 40 people on one table or 75 for buffet. The Lodge is very flexible and can accommodate seating for 70 or buffet for 120. The main bar and Lodge have comfortable seating, an open fire and a large screen. There is also plenty of garden space should the weather be kind. For entertainment, a DJ or live band can be organised or for speeches, microphones and speakers can be arranged. The Queen's Arms and Queen's Lodge both have free super fast WiFi available. A full size table tennis table can be provided for the Lodge. Both the Queen's Arms and Lodge have open fires. 12 double rooms with king size beds. Four doubles can be converted into twins and connected. One suite has a sofa bed. Dogs/children welcome. The beds have crisp linen sheets and plump duvets - seriously comfortable beds! All 12 rooms are en suite with 9 showers and 3 baths. Soft towels and lovely REN toiletries supplied in each bathroom. All areas of the Queen's Arms and Queen's Lodge are accessible by wheelchair as are 5 of the 12 bedrooms. All rooms have TVs and the garden in both the Queen's Arms and Lodge are big enough for games and football with goal provided. Both the Queen's Arms and the Lodge have large gardens and terraces for al fresco dining. 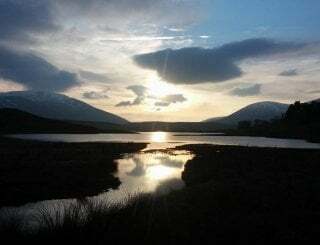 Plenty of lovely walks or bike ride opportunities locally. The Queen's has a very large car park with ample space for all in the hotel and Lodge. Smoking is not permitted anywhere inside but smokers are catered for with a large covered area outside. Dogs welcome - we provide beds and dog treats! Located just 3 miles from Junction 14 of the M4 at Hungerford. In an area of outstanding beauty and close to Newbury Racecourse, Avebury and Stonehenge, The White Horse at Uffington. Hungerford 6 miles, Marlborough 12 miles, Swindon 18 miles, Oxford 25 miles, London 65 miles, Bristol 45 miles. Hungerford Antiques Market 6 miles, Marlborough market square 12 miles. Rates include bed and breakfast for all 12 rooms at The Queen's Arms plus private use of the Queen's Lodge. All other costs for food and drink will be invoiced at a later date. Easily accessible by train (Hungerford, Didcot and Swindon) . Bus to Lambourn and Newbury. Heathrow, Bristol, Southampton with private heliport.